Also please note, that I also read on many occasions that X300 is pretty much “un-soakable”, I took this information pretty seriously cuz I’m bit clumsy and I tend to spill stuff on my notebooks, every single one I had in my life eventually had the same faith. Ways of faith eh? Nevertheless, I did the “standard” procedure when you spill something on your machine (got some experience on this issue, from previous accidents) so after it got all dry I saw that my keyboard just won’t cooperate. I took it to the dealer I get it from (Genelec) they sent it to Lenovo in Sarajevo. (I’m currently residing in Tuzla) I even talked to one of the guy from Lenovo, told about everything that happened, he said they’ll need to order new keyboard, I said I want English layout keyboard (instead of Bosnian/Croatian one, I previously had) he told me it’ll be ~150+ euros, since things like this one (spilling stuff) isn’t covered by my warranty, and it’s that expensive since they’ll have to order it from London and X300 is “special” series. Sure, I said no problem, just get it fixed, also to check my battery, cuz I believe there’s something wrong with it. Weeks later I got information that they have ordered keyboard, and that it has arrived, but that they’ll have my notebook ready till they also get a new battery, in the end it was faulty battery or something and that battery will be covered by warranty. I had the same problem with this laptop I’m typing this from (Toshiba L100-121) I had same problem while I was on DebConf7 in Edinburgh, except it was juice. 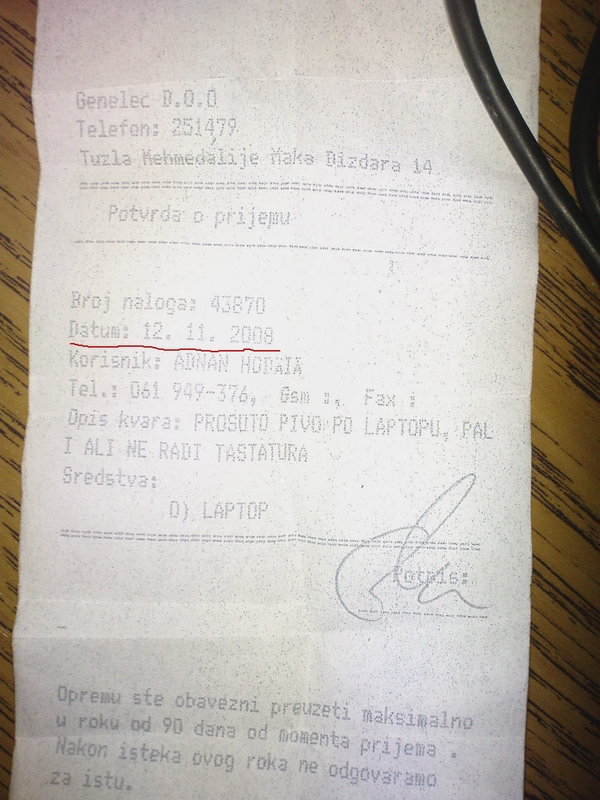 So it was not my “native location”, but all I did is I contacted nearest Toshiba Centre, they only asked for serial number, problems were greater, they had my both display and keyboard fixed all under warranty, as I remember I had only to pay some symbolic ~50 euros, and we do know how much displays cost; and it was fixed within days. Now, I’m at point where I can’t (I really don’t have any energy left regarding this issue) to either contact Genelec service, people I know from Genelec, or Lenovo Sarajevo, this is really my last resort, going public. I handed this notebook on 12th November last year, you can check it yourself on the receipt, now the only question I got for Lenovo is, is this how you treat your customers? In just a couple of days it’ll be 2 months, and you couldn’t change the keyboard in ~60 days? To be quite frank with you, I find that fascinating. My second question is, what is the time period in which I can request my full money back fee, 3 months, 6 months? Ever? Please don’t mind my bitter tone in this post, but frustration would be a lite word how I feel right now.